Adopt movable bench to make manipulator run stably with good linearity. Auto laser ranging system is equipped with welding torch, so that the relative position between the point to be welded and the vertical face of rack are ensured to be no variation. There is angle adjustment for welding torch. Welding torch angle can be adjusted at will for seams at different positions, to ensure welding quality. Welding flux recycling device can reduce worker labor strength greatly, reduce flux waste and reduce production costing. Electrical control automation level is high. Cable laying is simple. Maintenance is convenient. System reliability is high. 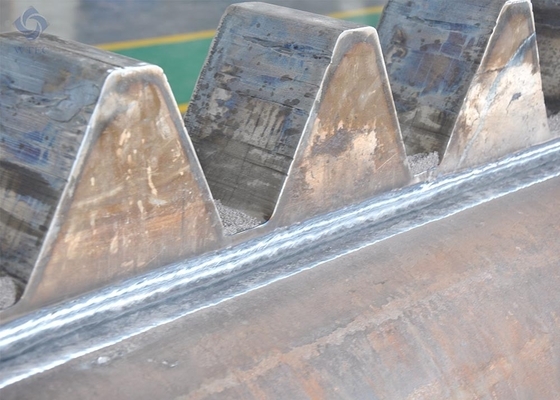 This machine is mainly used for welding semicircle tube and spud leg of self-elevating drilling platform. It adopts single wire SAW process, and welding wire diameter is Φ4.0.